Lettres sur la Suisse, adressées à Madame de M*** par un voyageur françois, en 1781. En 2 volumes. 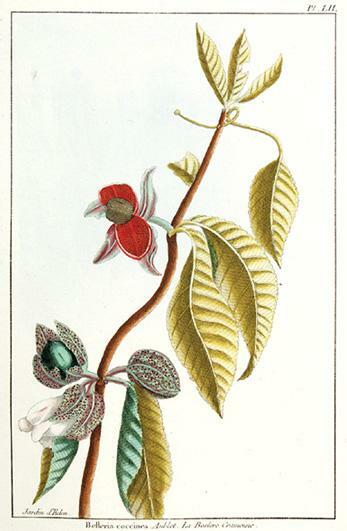 Genève, Jombert jeune, 1783, - in-8vo, 2 ff. + 271 p. / 2 ff. + 282 p. (p. 3/4 et 5/6 rel. avant p.1/2) + 1 f. (errata) + 3 planches gravées repl. dont la grande Carte générale de la Suisse (avec les glaciers de Faucigny), partiel. en coul., qqs rares pet. taches ou brunissures, généralement frais, ex libris héraldique gravé à l'intér. des plats devant, reliures en veau marbré, pièce de titre rouge-brune au dos, dos richement ornés en or, éraflures au niveau de la tomaison juste en-dessous des pièces de titre, qqs lég. frottements aux coiffes, bords et coins, au total quatre coins écrasés et dénudés, tranches rouges. Première et unique édition, assez rare. 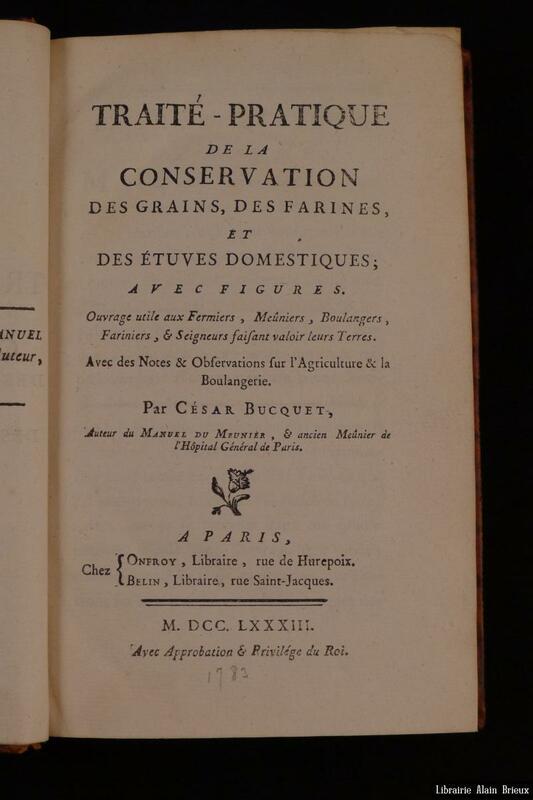 Récit du voyage effectué par l'auteur à travers de Suisse en 1781. Exemplaire complet de la grande "Carte générale de la Suisse?, qui manque souvent. Les détails de Faucigny sont de la plus grande exactitude, et les célèbres glaciers de ce canton n'avaient été marqués jusqu'ici dans aucune carte", avec frontières, villes, et route de l'auteur marquées en couleurs. Ainsi qu'un plan de Versoix, et un plan des souterrains des salines de Bévieux.Please notify before visiting to see a book. Prices are excl. VAT/TVA (only Switzerland) & postage. 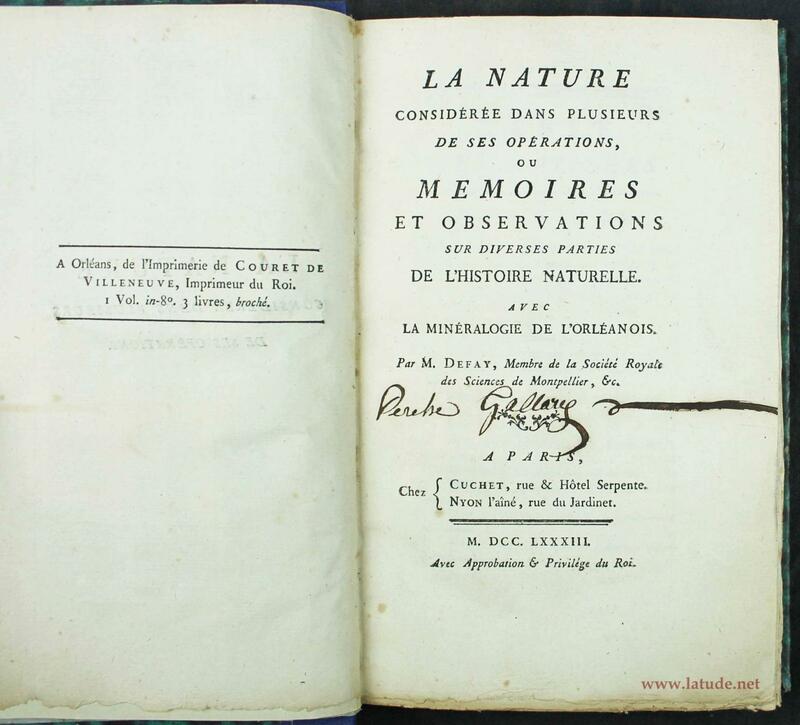 Perret 2505; Barbier II/1298cd; Haller I/1017; Wäber BSL III/42; Barth 17546; selon «Mélanges Helvétiques, 1787, p. 236, p. 236, le nom de l'auteur serait "La Porte"; Blumer 289 (la carte). nella Reale Stamparia, 1783. In-8°, pp. XVI, 197, (3), stemma araldico al frontespizio, ritratto di Maria Adelaide inciso dallo Stagnon, legatura in piena pelle dell'epoca, dorso con ricchi fregi e titolo in oro al dorso. Tagli rossi. Leggere abrasioni ai piatti ma nel complesso bell'esemplare. PIPINO, Maurizio (Cuneo, 1739 ) La 'Gramatica' insieme al vocabolario piemontese erano parte di un preciso progetto appoggiato dalla futura sovrana «Maria Adelaide Clotilde Saveria di Francia, principessa del Piemonte»( a cui è dedicata l'opera) che volendo apprendere il dialetto» piemontese aveva contribuito a valorizzarlo. Il modello di piemontese proposto dall'autore fu da lui stesso qualificato esplicitamente come «torinese o cortigiano» (Grassi, 1979, p. 703). Pipino ammise infatti che nel Vocabolario erano contenute voci definite «provinciali», cioè non torinesi, benché esse fossero in numero assolutamente esiguo, essendo preponderante la varietà della capitale L'opera è divisa in quattro capitoli:1. Dell'alfabeto piemontese; 2. Delle pronunzie piemontesi; 3. Articoli, segnacasi, generi e declinazioni; 4. Conjugazione de' verbi, e arricchita inoltre da un Breve discorso circa la terminazione de' verbi, da un'Appendice, da un corpus di Lettere piemontesi-italiane che provengono dal repertorio personale del medico piemontese e da alcuni saggi di due libri di Giorgio Arione e di Michele Vopiscopo. L'opera si conclude con una Lettera all'autore del trinitario scalzo Ermenegildo di S. Giovanni di Matto e con una Raccolta di proverbi e modi proverbiali piemontesi. A practical treatise on chimneys. 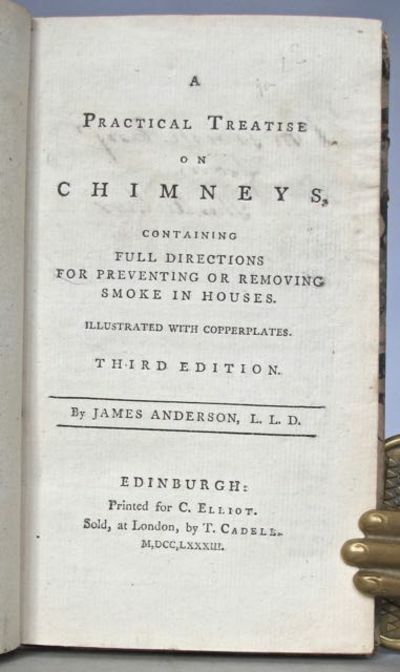 Containing full directions for preventing or removing smoke in houses, Illustrated with copperplates. Third edition. Edinburgh: printed for C. Elliot. Sold, at London, by T. Cadell. 1783. 12mo., large folding engraved copperplate comprising 18 figures, vi + 82 + (2)pp., including the final leaf of 'Directions to the Binder', contemporary quarter calf over marbled boards, old paper label on spine, upper joint cracked but sound, slight wear to extremities, else a very good presentation copy inscribed in ink 'M'Tavish Esqr from the Author>' and with the later armorial bookplate of Seton of Mounie on front pastedown. 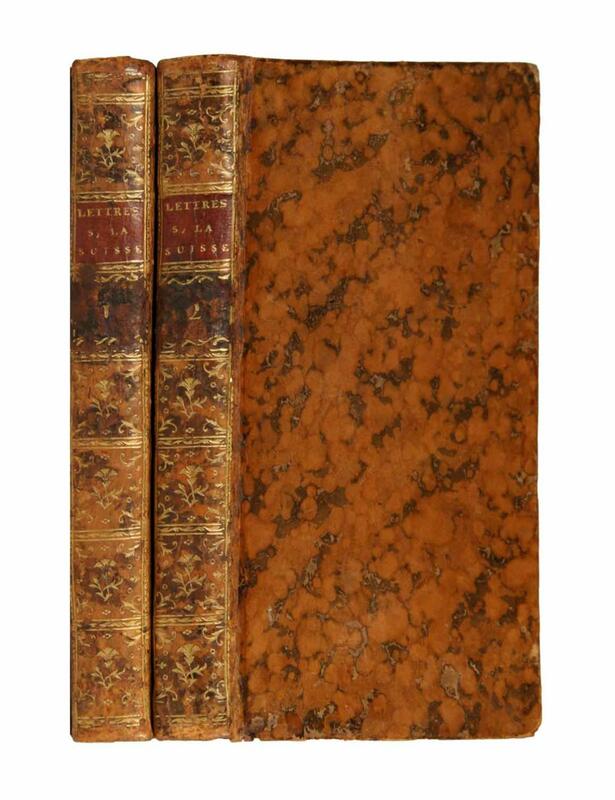 A very scarce edition, ESTC recording copies at only 4 libraries: BL + NLS + Un. of Delaware + Niedersachsische Staats-Bibliothek. An analysis of the causes of smoky chimneys with suggested solutions to the problem. 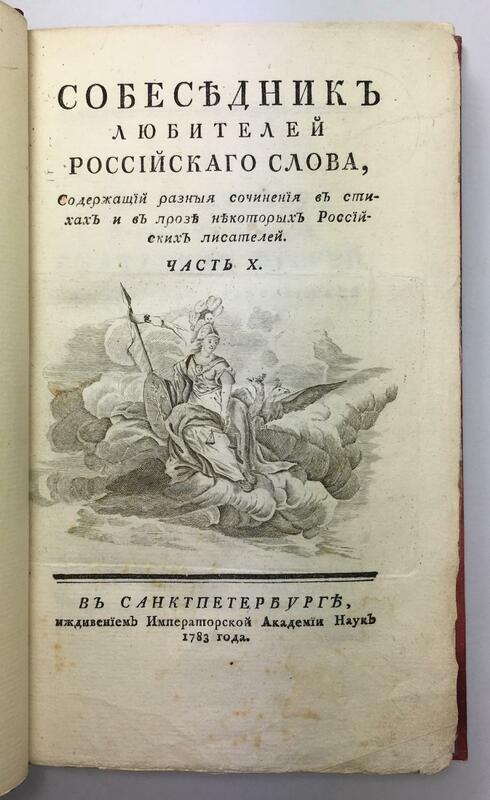 This work was first published anonymously in an Edinburgh edition of 1776 but, as the author explains in his Advertisement>, he has cast aside his concealment as other writers 'of several Treatises' and inventors had been taking advantage of his ideas. Dr James Anderson (1739-1807) was a Scottish agriculturist and political economist who co-operated with Jeremy Bentham and Sir John Sinclair of Ulbster, the famous Scottish agronomist, but also produced a large body of his own work and issued the monthly Recreations in Agriculture>, 1797-1802. 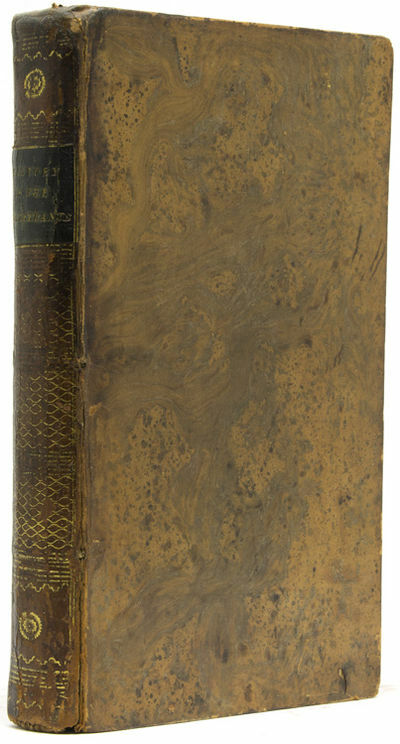 Although Anderson originally signed this particular copy for an unknown M'Tavish, it later passed into his wife's family, the Setons of Mounie, Aberdeenshire. Anderson married the heiress Margaret Seton in 1768. The inscription, A. Seton>, may refer to their eldest son, Alexander (1760-1850) who succeeded his mother in 1768, having assumed the Seton surname by the terms of succession, or possibly his eldest son, also Alexander, born 1815. Scomber Thynnus. Der Thunfisch, Le Thon. The Tunny. - altkol. Kupferstich v. L. Schmidt n. Krüger jun. aus Bloch, Oec. Naturgeschichte der Fische Deutschlands, 1783, 17,5 x 36 Sehr schönes, farbfrisches Blatt. Speisefisch. Verkleinerte Darstellung. 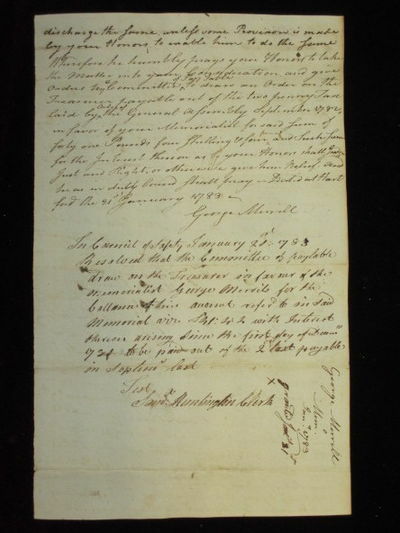 1783 - The Administration of a Small New Hampshire Town, 1783-1815 [Manuscript Archive]. [New Hampshire]. [Documents Relating to the Town of New Ipswitch, 1783-1813]. New Ipswitch, NH, 1783-1813. 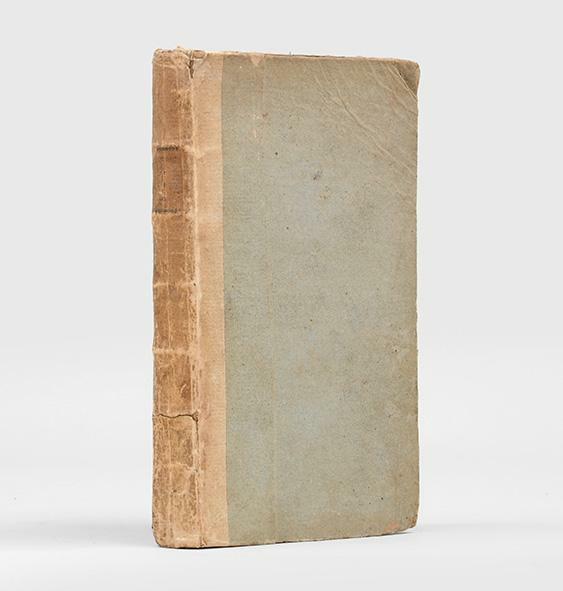 7 stab-stitched manuscript volumes, 1 is 6-1/4" x 4" (18 pp. ), 1 is 12-1/2" x 8" (12 pp. ), 1 is 14" x 12-1/2" (16 pp.) and 4 are 7-1/4" x 6-1/2" (6 pp., 8 pp., 14 pp., 18 pp.). Manuscript in ink to most rectos and versos. Moderate browning, somewhat lighter in places, foxing, some leaves have dampstaining, tears or chips, with loss of text in a few cases. An interesting archive. $850. * New Ipswitch is a small New Hampshire town on the Massachusetts border, about 40 miles north of Worcester. 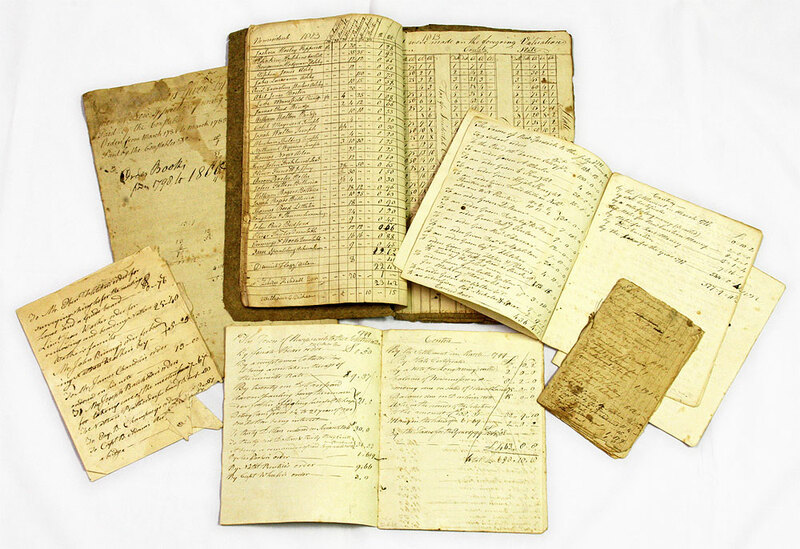 The volumes in this archive record the daily operations of the town government, such as lists of taxes collected from residents and payments for selectmen, constables and building expenses. It is, on the whole, an interesting collection of source material concerning the inner workings of small New England town government in the post-Revolutionary period. Commonwealth of Massachusetts, (Tax No 3), Thomas Ivers, Esq. 1783 - A Massachusetts Tax to Defray the Cost of the Revolutionary War [Broadside] [Taxation]. [Massachusetts]. Commonwealth of Massachusetts. (Tax No 3.). Boston, June, 1783. 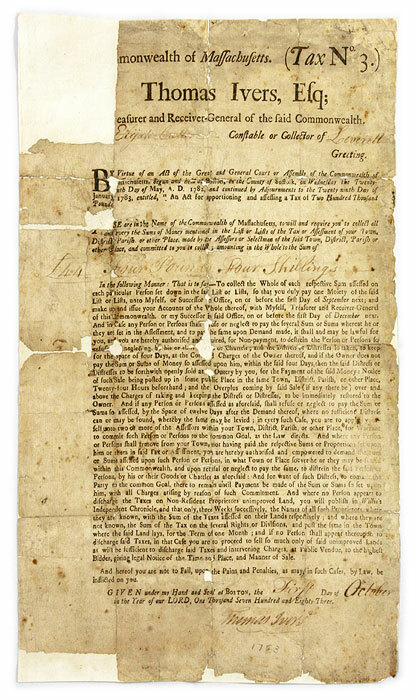 16" x 10" broadside, amount of assessed tax and date added in manuscript by Thomas Ivers, treasurer and receiver-general of Massachusetts, his signature, dated October 1, 1783, below text. Mounted on linen, lightly browned, some edgewear, sections lacking from corners and along fold lines with minor loss to text. A rare item. $1,250. * This broadside is, in effect, a warrant to collect unpaid taxes. In this particular case, an amount of four pounds and four shillings to be collected by the constable or collector in the town of Leverett, Massachusetts. According to Ford, this broadside was printed in June of 1783, at a time when the Commonwealth was trying to pay down expenses associated with the war. Financial hardship from the war would persist long after the conflict with Great Britain ended, and the Commonwealth applied sustained pressure to collect revenue from its cities and towns. Interestingly, this prophetic broadside foretells Shays's Rebellion, in that just three years later perceived economic and taxation inequities prompted rural central and western Massachusetts such as Leverett to rise up in a series of historic protests against the Commonwealth. No copies listed on OCLC. Ford, Broadsides & Ballads &c. Printed in Massachusetts 1639-1800 2371. Nordamerikas sittliche Zustände. Nach eigenen Anschauungen in den Jahren 1834, 1835 und 1836. 2 Bde. Gr.-8. 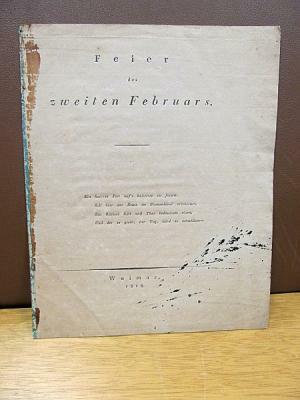 Erster Band ("Boden und Geschichte. Religiöses. Erziehung und Unterricht. Armuth und Mildthätigkeit. Volk und Gesellschaft") XXVIII, 514 S. mit 2 gefalt. Musikbeilagen u.1 gefalt. Karte. // Zweiter Bd. ("Verbrechen und Strafen") XII, 502 S., 1 BI. Mit 68 "Tafel" genannte Tabellen (auf 27 beidseitig bedruckten Falttafeln) u. mit 13 lithogr. Falttafeln ("Platte" genannt) mit zahlreichen Abb. u. Grundrissen. Bd. 1 Schwarze Pappe d. Zeit mit Rückenschild in Rot. Bd. 2 ist im gleichen Stil sehr gut nachgebunden. Erste Ausgabe des epochemachenden Werks (Howes J 277. Sabin 36891. ADB XIV, S. 687). Der Hamburger Arzt und Schriftsteller Nikolaus Heinrich Julius (1783-1862) gilt als Begründer der Gefängniswissenschaft und reformierte das Gefängniswesen in Preußen. - Die 68 interessanten Tabellen listen Verbrechen, Gerichtsverhandlungen, Anklagen und Strafen auf, teils nach Hautfarbe u. Geschlecht differenziert. - Die Lithographien zeigen z. B. die genaue Architektur des Gefängnisses von Kingston / Ontario (9 Grund u. Aufrisse auf 4 Falttafeln), der Strafanstalten in Philadelphia, Pittsburg usw. - Die Musikbeilagen sind die Noten von "Yankee Doodle" und "The Bee-Gum". Besonders interessant ist die Karte "Vereinigte Staaten", die den damaligen Stand zeigt: "Die Sklavenstaaten sind schraffiert." - Titel gestempelt, alte Besitzeiträge auf den Vorsätzen, sonst außergewöhnlich gutes Exemplar mit weißem, fleckenlosem Papier. - Alle Tafeln sind sehr gut. Scutch Mill, with the Method of Breaking the Flax with groved Rollers, and Scutching it with Blades fixt on a Shaft, both turn'd by the Main Wheel'. - Kupferstich v. William Hincks, 1783, 34 x 40,5 Thieme-Becker, Bd. XVII, S. 112. - Blatt V aus der Stichfolge von 12 Blatt von William Hincks, der die einzelnen Stadien der Flachsarbeit und Leinenfabrikation in Irland veranschaulichte. - Zeigt die Flachs-Schwingmaschine. 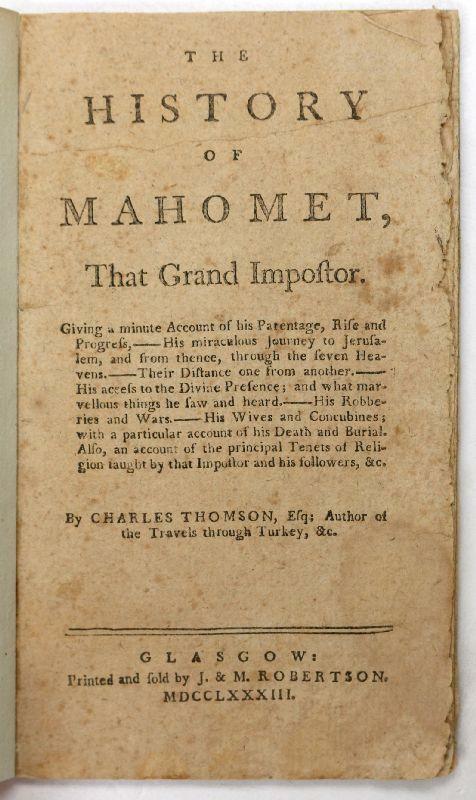 The History of Mahomet, That Grand Impostor. MEN'S SINS NOT CHARGEABLE ON GOD, BUT ON THEMSELVES. A DISCOURSE DELIVERED AT WALLINGFORD, DECEMBER 22, 1782. 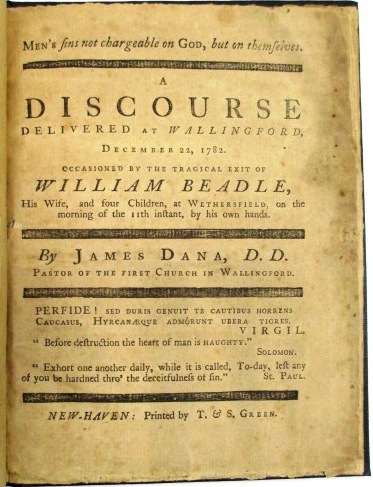 OCCASIONED BY THE TRAGICAL EXIT OF WILLIAM BEADLE, HIS WIFE, AND FOUR CHILDREN, AT WETHERSFIELD, ON THE MORNING OF THE 11th INSTANT, BY HIS OWN HANDS. Kopergravure vervaardigd in 1783 door Matthias de Sallieth, naar een tekening van Gerrit van der Pals, die op zijn beurt een schilderij van Ludolf Backhuysen kopieerde. Afm. 28 x 36,2 cm.We zien Hoek van Holland in 1684. Op de oever drie mannen en een vrouw die een hondje aait. Op de voorgrond in het water een binnenkomende snik met spriettuig, zijn zeilen innemende. Het schip draagt een witte vlag in top, met daarin het jaartal 1684.Erachter twee grote schepen onder zeil. Het achterste vaartuig draagt in zijn spiegelversiering het wapen van Amsterdam. Aan de horizon zijn nog enkele andere vaartuigen zichtbaar alsmede de oever aan de overkant van het water.Werk van Ludolf Backhuysen (1631-1708) vertoont sterke invloed van Willem van de Velde de Jonge. Backhuysen schilderde havengezichten en scheepsportretten, maar bekend werd hij vooral door zijn stormachtige zee?n en schipbreuken. Hij verbeeldde talrijke voorvallen uit de Hollandse maritieme geschiedenis.Prijs: ?975,- (incl. lijst). Essai sur les accusations intentées aux Templiers et sur le secret de cet ordre, avec une dissertation sur l'origine de la Franc-Maçonnerie. Ouvrage traduit de l'allemand. Amsterdam, chez D.J. Changuion, 1783, in 12, 2ff. n.ch. 224 pp. et une planche gravée de pentacles, demi-basane bleue XIXe, bon exemplaire. Ouvrage très rare, traduit de l'allemand par Beyerlé selon Besuchet, et par Renfner selon Quérard. Nicolaï fait remonter la Franc-maçonnerie à une société de Rose-Croix créée vers 1630 par Robert Fludd, laquelle sous l'influence des événements politiques se serait transformée peu à peu. Cette dissertation contient de nombreux renseignements sur E. Ashmole, V. Andrae et surtout J. Wilkins " l'homme le plus savant de son siècle et le beau frère de Cromwell". La planche gravée représente des pentacles et autres talismans attribués aux templiers. ¶ Dorbon n°3243 - Caillet n°7977 - Dessubré n°772 ".. Templiers que l'auteur considère comme les vrais fondateurs des Sociétés secrètes... C'est Nicolaï, qui le premier a mis en circulation le mot de Bafomet... et imaginé la doctrine secrète des Templiers..." - Pas dans Guaïta. Paris: Louis Joseph Mondhare. unbound. very good. Map. Engraving with original hand coloring. 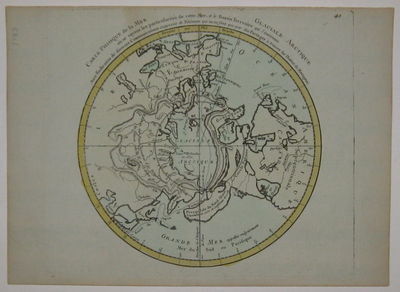 Page measures 9" x 12.5" Beautiful map of the Northern Hemisphere, showing the mythical Northwest Passage and Bay of the West. Great example of early North American exploration. Prepared circa 1783 by Nolin after the Phillipe Buache map of 1753. Published by Mondhare in "Atlas Général a l'usage des colleges et maisons d'education...", 1791. Minor toning along edges. 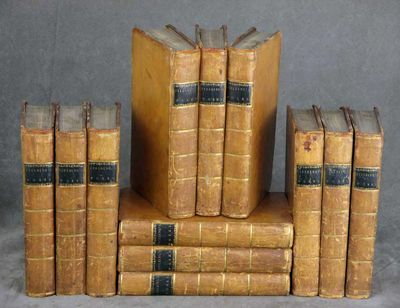 W. Strahan, London 1783 - Complete in Twelve Volumes. c.1783. 8vo. Full original orange-tan calf with black spine labels, copperplate frontispieces. Very Good. Occasional soil, stains, rubbing, contents very good. Kort Beskrivelse over den nye Vulcans Ildsprudning i Vester - Skaptefields - Syssel paa Island i Aaret 1783. A history of the revolt of Ali Bey, against the Ottoman Porte, including an account of the form of government of Egypt; together with a description of Grand Cairo, and of several places in Egypt, Palestine, and Syria: to which are added, a short account of the present state of the Christians who are subjects to the Turkish government, and the journal of a gentleman who travelled from Aleppo to Bassora. 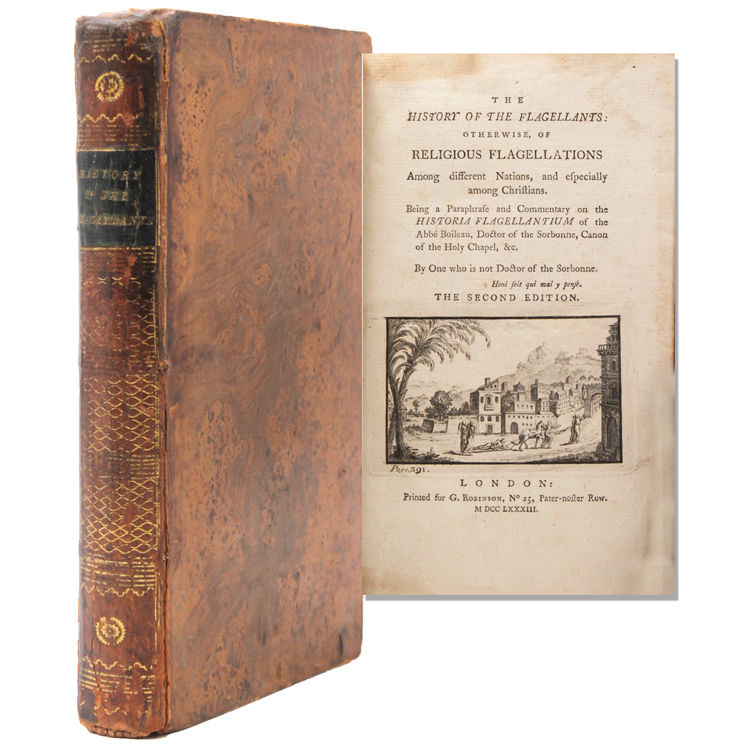 Observations on the Passage to India through Egypt, and across the Great Desert; with Occasional Remarks on the adjacent Countries, and also Sketches of the different Routes. Hartford and Middlebury. Manuscript document signed "Test(ament) / Saml. Huntington, Clerk" of Council of Safety, Hartford, Jan. 20, 1783; 7 3/4" x 12 1/2" - To "His Excellency the Gov. & Council of Safety" presenting petition of George Merrill of Hartford. "In.....Dec. 1780, Chauncey Whittlesey of Middletown, Purchaser of Cloathing for this State and for the Use of the Continental Army....bought of.....(Merrill) Sundry articles of Cloathing to the amount of about (BP) 1100 money....At the time (Merrill) consented to part with his said Goods, he had the strongest assurance from Whittlesey and some of the Members of the Council of Safety....that he should be paid....cash or something equivalent. That to his very great Disappointment and Embarrassment in his Business he was obliged to Receive.....many Payments at a very great loss....Now informed by Mr. Whittlesey that he has Nothing in his hands to pay......" Beseeching the Council to make good on the debt, "Payable out of the two penny Tax" for the balance due of (BP) 41....." Above Huntington's signature as Clerk, it is resolved that the Council on Safety will pay. Slight smudge on "m" in Saml. A fine example. Manuscript document signed by Whittlesey, Middlebury, Jan. 16, 1783, certifying that a "ballance" of (BP)41 " Lawfull Money" remains unpaid; 6 1/2" x 7 3/4". A fine example. A Yale educated minister, Whittlesey was a "purchasing clothier" and supplier of rum for the Continentals. During John Adams' administration, he acted as buying agent for cavalry swords. Manuscript ledger sheet, 8 1/4" x 13" - "State of Conn. in ac(count) with George Merrill....for Sundry Articles of Cloathing....." plus interest for 13 months. Boldly signed by Merrill upon receiving funds at Pay Table Office, Jan. 23, 1783. A fine, fresh example. Samuel Huntington (1731 - 1796) Signer of the Declaration of Independence and the Articles of Confederation. He served as President of the Continental Congress from 1779 to 1781 and was the 18th Governor of Connecticutt from 1786 until his death. 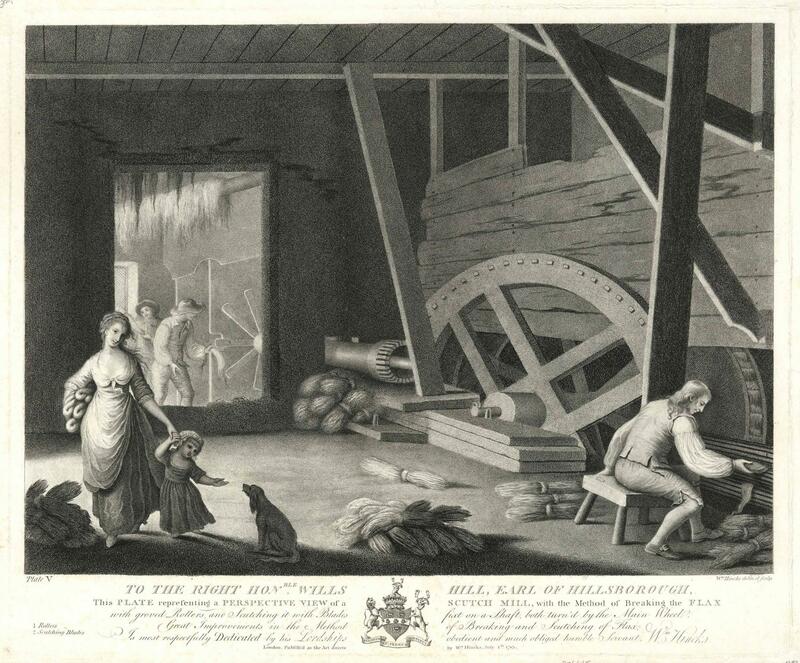 London: W. Strahan, 1783. Full Calf. Very Good. Complete in Twelve Volumes. c.1783. 8vo. 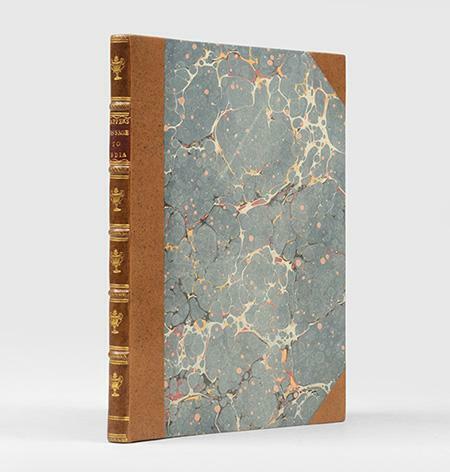 Full original orange-tan calf with black spine labels, copperplate frontispieces. Very Good. Occasional soil, stains, rubbing, contents very good. 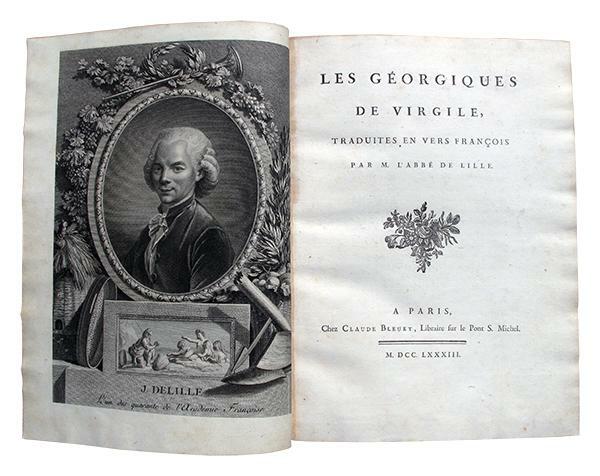 Les Géorgiques, traduites en vers françois par M. l'abbé de Lille. Passiflora Monnieri Nobis. La Grenadille de Monnier. Paris: Chez l'auteur. 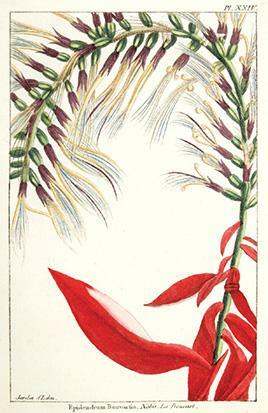 Le Jardin d'Eden., 1783.. XXII. Copper engraving. Original colour. Fine condition Size: 20.5 x 33 cm. (8 x 13 inches) This attractive copper engraving is from Buchoz's 'Le Jardin d'Eden, le Paradis Terrestre renouvelle dans le Jardin de la Reine a Trianon' in Pierre Buchoz's supplement to the work Collection des Plantes les plus rares, qui se trouvent dans les deux Hemispheres. Buchoz or Buc'hoz (1731-1807) was born in Metz. At the age of 28, he was appointed physician to the King of Poland, but left his post to pursue his interest in botany. The plants are from the queens garden in the Tuileries. 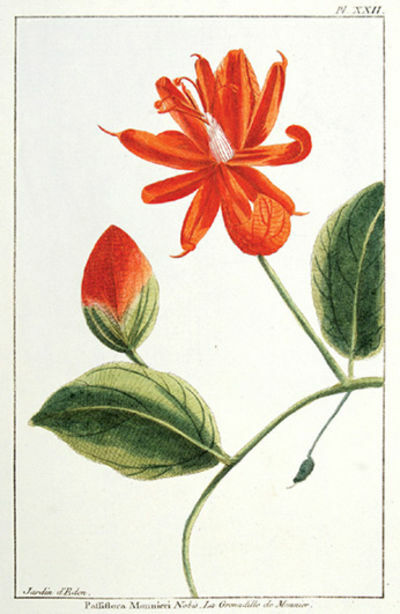 Besleria coccinea. Aublet. La Beslere Cramoisie. LII. Paris: Chez l'auteur, 1783 - Copper engraving. Original colour. Size: 20.5 x 33 cm (8 x 13 inches). Fine condition. These beautiful copper engravings come from "Le Jardin d'Eden, le paradis terrestre renouvelle dans le Jardin de la Reine a Trianon" in Pierre Buchoz's supplement to the work Collection des plantes les plus rares, qui se trouvent dans le deux Hemispheres. The plants are from the Queen's Garden in the Tuileries. Epidendrum Bouvartia. Nobis. La Bouvart. XXIV. 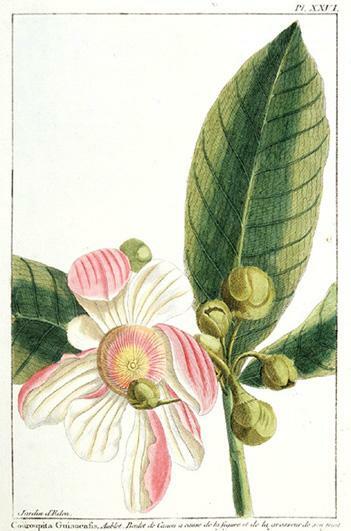 Couroupita Guianensis. Aublet. Boulet de Canon a cause de la figure et de la grosseur de son fruit. XXVI. Paris: Chez l'auteur, 1783 - Copper engraving. Original colour. Size: 20.5 x 33 cm (8 x 13 inches). Fine condition. This attractive copper engraving is from Buchoz's "Le Jardin d'Eden, le paradis terrestre renouvelle dans le Jardin de la Reine a Trianon" in Pierre Buchoz's supplement to the work Collection des plantes les plus rares, qui se trouvent dans le deux Hemispheres. Buchoz or Buc'hoz (1731-1807) was born in Metz. At the age of 28, he was appointed physician to the King of Poland, but left his post to pursue his interest in botany. The plants are from the queens garden in the Tuileries. 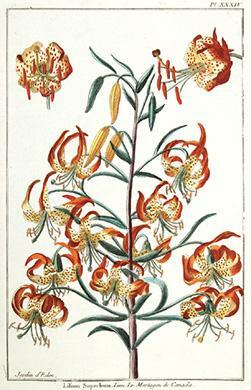 Lilium Superbum. Linn. Le Martagon De Canada XXXIV. Paris. 1783. - Mount size: 495 × 375 mm. Fine condition Copper engraving. Original colour. This outstandingly beautiful copper engraving comes from LE JARDIN D'EDEN, LE PARADIS TERRESTRE renouvelle dans le Jardin de la Reine a Trianon OU COLLECTION DES PLANTES LES PLUS RARES, qui se trouvent dans le deux Hemispheres. The plants are from the queens garden in the Tuileries.